Circus East is a proposed 6th phase of development of Battersea Power Station located on the eastern side of the iconic four chimney structure, a village within the development. 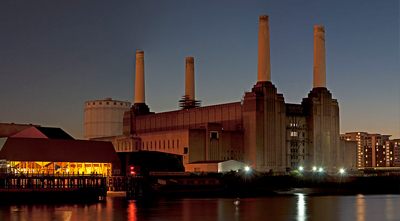 When Battersea Power Station was originally sited, its location was of major importance. For practical power generation reasons, The Power Station had to be located close to the river and centrally within the growing city of London. Now high class city living has created more exciting reasons to be located close to the water's edge. The Circus East Development of Battersea Power Station will offer views north east up the River Thames towards the Palace of Westmister and the London Eye. Apartments Circus West at Battersea Power Station will offer the very best in city living. Properties in previous phases of the development have been well received by would be London residents. The existing phases of development will mean property owners in Circus East will be part of an already established village-like community. Although the sprawling metropolis of London can to some, seem large and anonymous, this won't be the case in Circus East. Village life is at the centre of Battersea property development design in Circus East. Village life is achieved by breaking the Battersea Power Station Development down into smaller sections, including Circus East, village like communities will be created. Residents will feel part of a much smaller, personal, community, just like the suburbs that surround the city centre. Please email info@circuseast.co.uk for information about upcoming property availability. Circus East is a phase of development of Battersea Power Station.